​Welcome to the St. Joseph Catholic School 5th Grade Website!! My name is Kristin Hammar and I am very excited for my fourth year at St. Joseph Catholic School! I am new to 5th grade this year, having taught 4th grade the three years prior to this. ​I have had such great experiences here, always receiving a warm welcome from the families of the parish and school community. I earned my teaching degree from Eastern Michigan University and I am also endorsed by the state of Michigan to teach Social Studies! I am very excited to be teaching 5th - 8th grade Social Studies and History this year! My husband and I live in Carleton, Michigan with our two boys and our two Labs. We are active in our local community and are members of Divine Grace Catholic Church, St. Patrick Parish, in Carleton. and experience new challenges that will help them build on their knowledge. and the teachings of Jesus can be incorporated with all of our subjects. ​ is a safe and fun, yet disciplined, place for all. writing ​in their planners each night! Click on the buttons to the right ​to find my weekly newsletters. ​Click on the Spelling pencil for this week's words. Bridge to Terabithia. Check back soon! ​5th and 6th graders can click on this link to enjoy a digital copy of Scholastic Magazine. Throughout the year, the 7th and 8th grades will be watching CNN10. CNN10 Explains global news to a global audience. The show's priority is to identify stories of international significance and then clearly describe why they're making news, who is affected, and how the events fit into a complex, international society. Viewers will learn from every story and the show maintains a neutral position on controversial topics. It seeks to provide multiple viewpoints, clear illustrations, and general overviews instead of graphic descriptions. Click on the image on the right to be directed to the latest episode! Your student's grades are available to view on PowerSchool! ​Click the apple to get started! ​Ordering books from Scholastic is fun and easy! Scholastic Order Forms will be sent home periodically throughout the year. 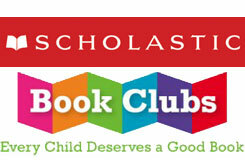 Click the Scholastic logo above for the direct link to the website! Our class code is PC6LV. ​in faith, knowledge, and abilities.